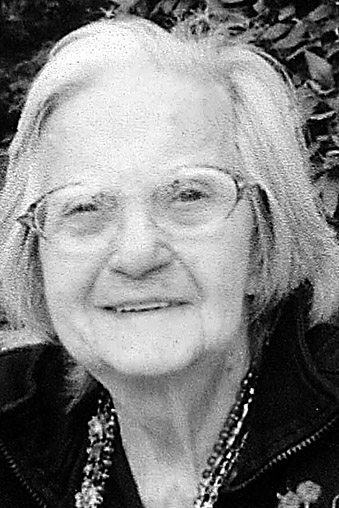 Elizabeth Mae “Betty” (Conrad) Auker, 94, Hollidaysburg, formerly of Altoona, passed away at The Lutheran Home at Hollidays­burg. Betty was born in Cresson, daughter of the late Walter and Della (Brandt) Conrad. She married Fred A. Auker on March 3, 1946, and he preceded her in death on June 2, 1982. Surviving are a son, Fred “Jack” Auker (Pam) of Quincy, Fla.; a daughter, Esther “Essie” Auker of Altoona; eight grandchildren: Richard F. Fiore Jr. (Stacy), Sara L. Fiore-Gunnett (Bill), Michael L. Fiore (Katie), Benjamin C. Auker, Richard F. Auker, Meredith M. Auker (Mike), Jesse J. Auker and Savannah A. Crain (Ryan); a daughter-in-law, Mary Auker; and son-in-law, Richard F. Fiore Sr.
She was preceded in death by a son, Michael C. Auker; a daughter, Nancy M. Fiore; and nine sisters and three brothers. Betty was a graduate of Cresson High School and retired as telephone room manager at Solartherm Remodelers Co. Inc. She was a member of St. Rose of Lima Catholic Church, Altoona. Betty enjoyed playing bingo, gardening, reading, watching sports on TV and spending time with her family. Friends will be received from 9 to 11:30 a.m. Tuesday, March 27, 2018, at The Stevens Mortuary Inc., 1421 Eighth Ave., Altoona, after which a funeral Mass will be celebrated at noon at St. Rose of Lima Catholic Church, Altoona. Committal will be at Alto-Reste Park Cemetery. www.copsnkidsdelval.org or by sending a check made out to AAUW Makefield Area Branch c/o Kathy Quinn, Finance Officer, 7511 Germantown Ave., Philadelphia, PA 19119. Please put Cops ‘n’ Kids in the memo line on the check.